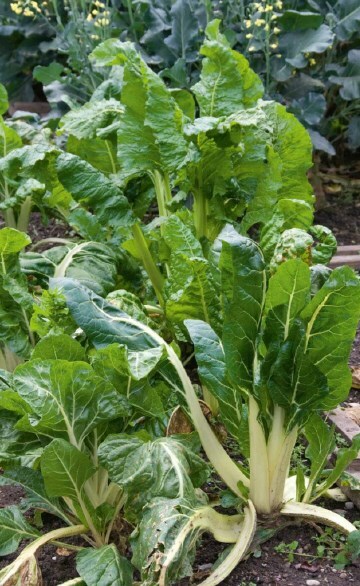 If there is any plant that you want to grow in your garden silver beet may be it. That’s not because of any magical properties it has but because it is highly perishable and is best eaten 10 minutes after it is harvested. IP you wrap it tightly in an airtight bag and keep it refrigerated, it might keep for five days but it is best eaten fresh. There has been confusion in Australia between silver beet and spinach (Spinacea oleracea) but. as their species names tell you, they are two quite distinct plants although they do belong to the same Family along with beets. As we shall see later there are some significant nutritional differences between spinach and silver beet. Silver beet is also known as Swiss chard in places like America, despite the Fact that it did not originate in Switzerland. In Fact, silver beet began in the Mediterranean and as Far back as the 4th century the Greek Aristotle was lauding its healthy properties. Silver beet is a great dietary source of fiber, iron, vitamin K, folate, vitamin C and beta-carotene. In addition it contains a range of antioxidant flavonoids. In Fact, it might be that one of these flavonoids could help with blood sugar control because it reduces the action of an enzyme called alpha-glucosidase, which breaks down carbohydrates intosimple sugars. If this enzyme is blocked fewer carbohydrates get broken down and blood sugar is able to stay more steady, this is especially useful after a meal. Add this to the high fiber content of silver beet and the potential benefits for blood sugar are many. Silver beet is also a useful Food For your bones. It contains reasonable amounts of calcium and importantly contains vitamin K as well. Vitamin K does a couple of things to support your bones. Firstly it stops excessive activation of cells called osteoclasts whose job it is to big up bone. On top of vitamin activates osteocalcin which anchors calcium molecules inside bones. While there are oxalates present in silver beet and they do reduce calcium absorption to a small degree, the evidence is that there is more than enough calcium present in silver beet to make up For that. So with vitamin K and calcium, silver beet is a great bone food. In the section on spinach we will spell out the many benefits of that particular leafy green vegetable, but since Australians can sometimes use the names silver beet and spinach interchangeably, it is worth a quick look at the nutritional differences. Spinach has almost double the fiber content of silver beet. A100 gram serve of cooked spinach contains around 6.3g of fiber while silver beet contains around 3.3g.That same 100g serving of spinach contains 2190 micrograms of betacarotene compared to 41Omcg in silver beet. In addition, spinach contains around three grams of iron and three grams of protein per 100g, compared to 2.2 grams of iron and 1.9 grains of protein in silver beet Spinach also has around 1.5 times the vitamin K content of silver beet. In one cup of spinach you get around 244mg of calcium compared to around 1OOmg from silver beet. Silver beet contains 108mcg of folate compared to 90mcg in spinach per 1OOg. Silver beet has almost twice the vitamin C content of spinach. Silver beet contains less of the undesirable oxalates only having 645mg per 100g compared to 750mg in spinach. On the other hand, spinach has less sodium (which can increase blood pressure), only having 2Qmg per 100y compared to 185mg in silver beet. Overall, particularly since a lot of people eat these foods thinking that they will get an iron boost, spinach comes out ahead of silver beet Of course, that doesn't mean that silver beet is not a wonderful and nutritious food (because it most certainly is). It just means that spinach is even better. When to plant: Soak seeds, contained in a cork-like coating, overnight to help with germination. Sow directly into the ground or in trays and transplant. Plant throughout the year in Frost-free areas. In cooler regions plant in spring through to autumn. Climate: Tolerates a range of climates. Watch For Fungal diseases in the humidity. Aspect/placement: Grows in a sunny but well-drained position. Specific needs: Likes plenty of nitrogen, potassium and water to ensure plants grow quickly and produce large, tasty green leaves. Prepare soil by adding manure and compost. Liquid Feed with seaweed solution and mulch with pea straw to retain moisture. Grows well in a pot. Harvesting: Start picking the outer leaves as soon as they are big enough this usually takes about six weeks Cut them or break them with a downward action. Remove flower stalks.